Moody’s today lowered its rating on the debt of The New York Times to junk status. This means that bonds the Times issues are now considered speculative and the newspaper company will have to pay higher rates of interest to attract investors. This will increase the pressure on the Times, which is already struggling to cope with a sheer drop in advertising revenues and a large debt load it has to finance. The Times debt is now six times its annual earnings before it deducts taxes and accounting charges (EBIDTA). That’s a debt that must be paid. If the Times can’t pay it, then you will. If the Times goes into bankruptcy, which isn’t likely, taxpayers will cover much of the unfunded Times pension liability through the the Pension Benefit Guaranty Corporation. The latest figures available are from the end of 2007, when the company disclosed a $275m gap between its $1.82b in obligations to its retirees and the $1.55b value of the fund assets set aside to pay ex-Timesmen. If I’m reading this right, that gap grew by $500 million in fiscal 2008. That means the pension plan lost as much as 32 percent of its value. Given that the S&P 500 lost 38 percent last year, this seems to make sense. The newspaper company is in trouble. It recently got a $250m capital infusion from Mexican billionaire Carlos Slim, but the Times must pay more than 14 percent annual interest. 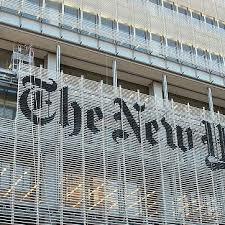 The Times is also trying to tap the capital locked up in its brand-new headquarters that could bring in another $225m. Update: Times CFO James Folio disclosed Jan. 28 that the company’s unfunded pension obligations are $625m, which means the pension fund lost $35om or 23 percent in 2008. That will cost the Times an extra $100m for the next seven years.